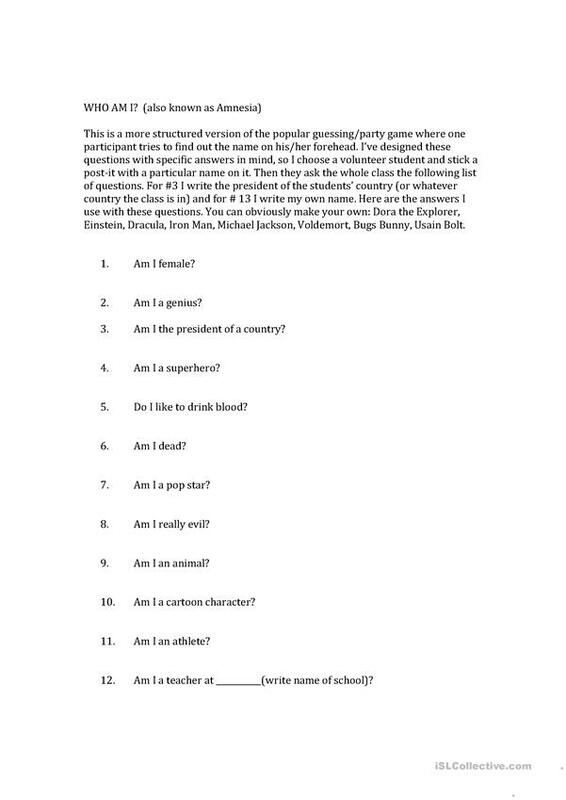 A fun deduction game that involves asking questions and guessing which secret celebrity you are. The above printable, downloadable handout was created for high school students, elementary school students and adults at Pre-intermediate (A2), Intermediate (B1), Upper-intermediate (B2), Advanced (C1) and Proficient (C2) level. It is aimed at revising Questions in English, and is excellent for strengthening your class' Listening and Speaking skills. It centers around the theme of Celebrities (stars, famous people). pariner is from/lives in France and has been a member of iSLCollective since 2012-10-23 10:08:05. pariner last logged in on 2019-04-25 16:36:08, and has shared 1 resources on iSLCollective so far.